Sometimes, we look around at food trends today and ponder what will be considered a classic a century from now. The wheat grass shot? The smoothie? We jest not; it can be hard to predict what current cravings will have staying power. Several dishes that rose to the culinary heights in mid-20th century American have nostalgia written all over them -- desserts made tableside, with fire, or things stuffed with other things, plus a hearty heaping of bread crumbs -- and we're happy that Los Angeles has so many places that are still doing those yummy delectables that boast particularly long CVs. One day we'll write a 14-part love sonnet to the jellied consomme and Chiffonade Salad on the Musso & Frank menu, but right now we must pay homage to Dal Rae, the swank Pico Rivera steakhouse that serves up the classics like Cherries Jubilee and Lobster Thermidor. The restaurant recently celebrated its 50th, and that's something to look for in an-open-today-closed-tomorrow world. Mom and Dad like the mid-century spot, hipsters like it, historians like it, steak fans like it, people who like to see doused-in-liquor fruit set aflame like it. We also like the Dal Rae's dance floor, the old-school service, and the Banana Flambe for two. "For two" is the nicest way to end a dessert's name. 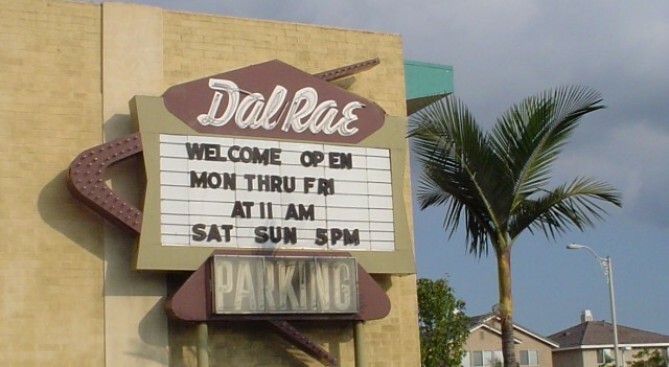 HOURS NOTE: The Dal Rae opens at 11:30 weekdays, and at 5PM for dinner nightly (note the time change from image).